NATIONAL manufactured the DUOLIAN between 1931 and 1940. 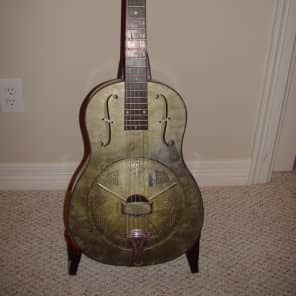 The Duolian was a metal bodied single cone resonator guitar. The body was made of steel with two f-holes (flat cut until 1933 and then with rolled edges from 1933-1940). The necks were mahogany or maple with an unbound dyed (ebonized) maple fretboard and pearl or ivoriod dots. Early models had 19 frets and joined the body at the 12th fret. From 1934 onwards they had 20 fret necks which joined the body at the 14th fret. The headstocks were slotted with classical style tuners (3 on a plate). The steel bodies were typically finished with "frosted Duco" crystalline paint finish. 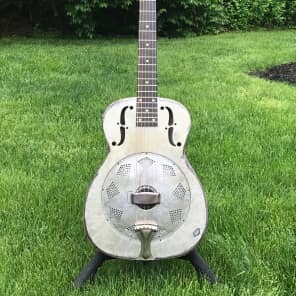 The Duolian has gained a reputation for classic blues tone: it was favoured by the early blues players due in part to its compact but loud body. "All metal body, ﬁnished in prismatic silver gray. The hardwood neck, joining the body at the fourteenth fret, is comfortable to play, especially in the high register. 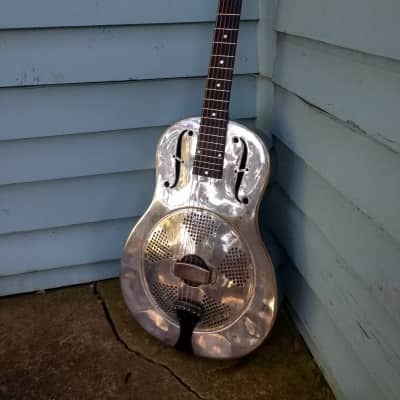 The National resonator produces a rich, powerful tone of beautiful quality. The Hawaiian model has a special square neck which enables the player to hold it more securely." Take the NATIONAL DUOLIAN price survey. Buy NATIONAL DUOLIAN acoustic guitars.